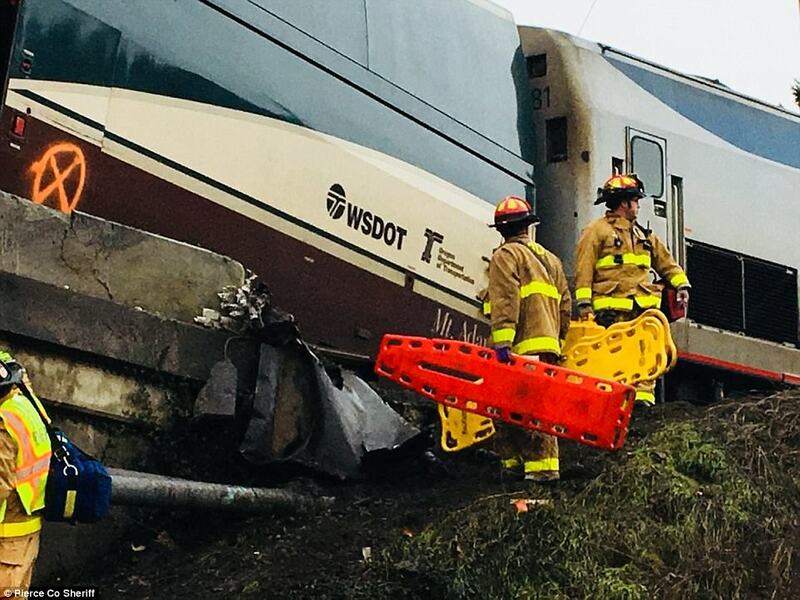 Multiple injuries and fatalities have been reported after an Amtrak train derailed on the maiden voyage of a new high-speed service linking Seattle and Portland. Law enforcement have not given an exact number of fatalities yet, but the Seattle Times reports that at least three are dead. 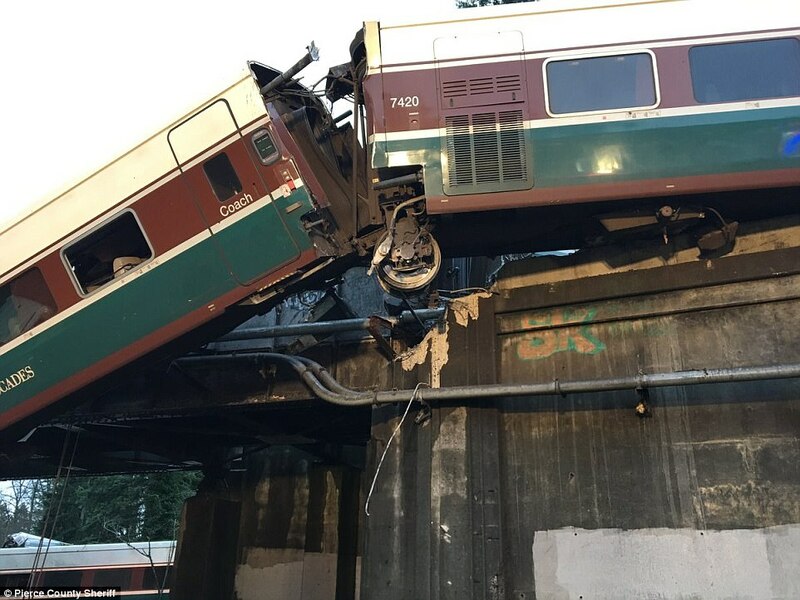 Train 501 was going south when it derailed while crossing a bridge over Interstate 5 near DuPont, Washington around 7:40am Pacific Time, causing at least one car to fall onto the freeway below. 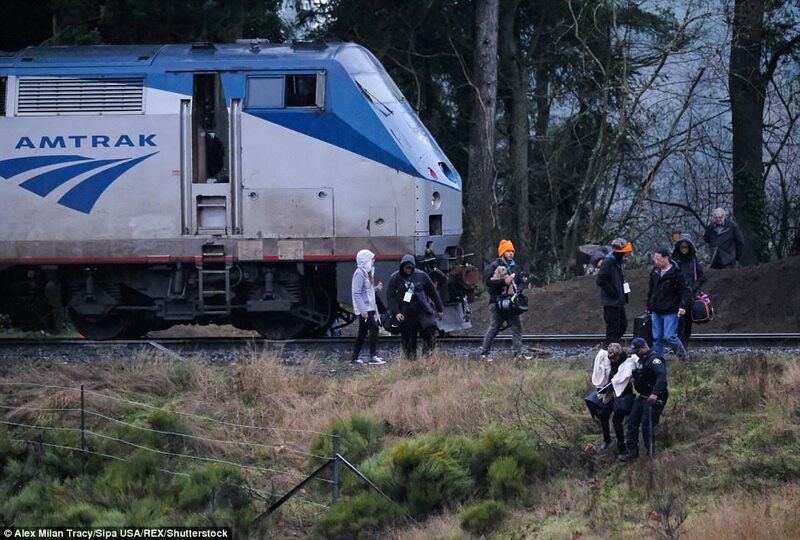 Amtrak confirmed its train was involved but did not provide further information. It was the first day of the new high-speed Cascade service, which rerouted trains down 14 miles of updated track. The new bypass between Tacoma and DuPont is straighter, meaning that trains can go faster than they did on the windy old line. 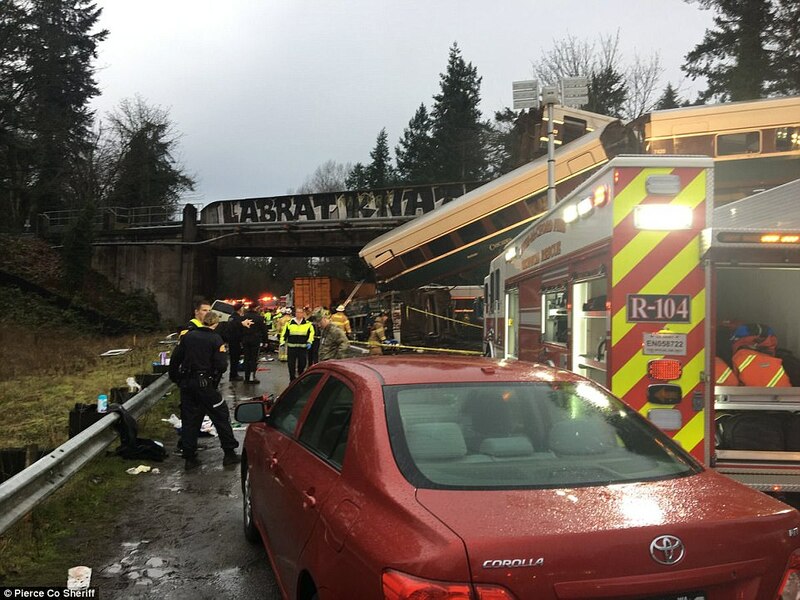 Right before the bridge, there is a sizable curve in the track and it's believed that the train was going about 80mph at the time. 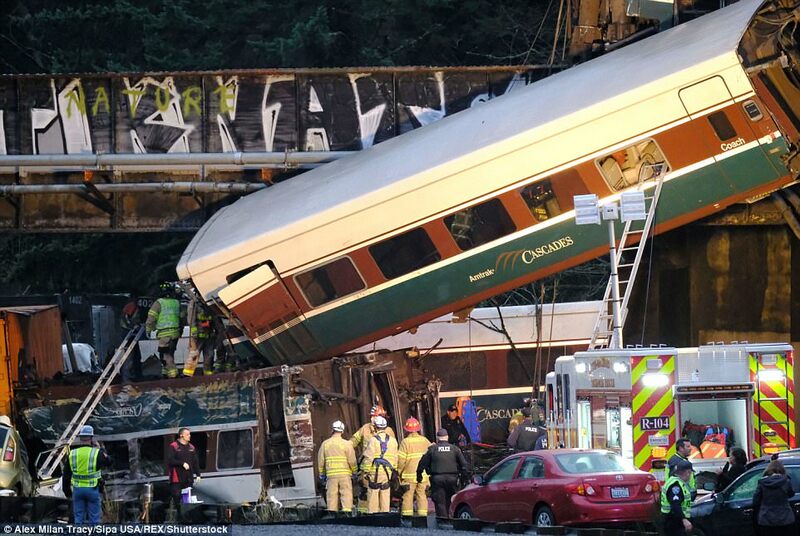 Seventy-eight passengers were on board, in addition to five crew members, KIRO reports. 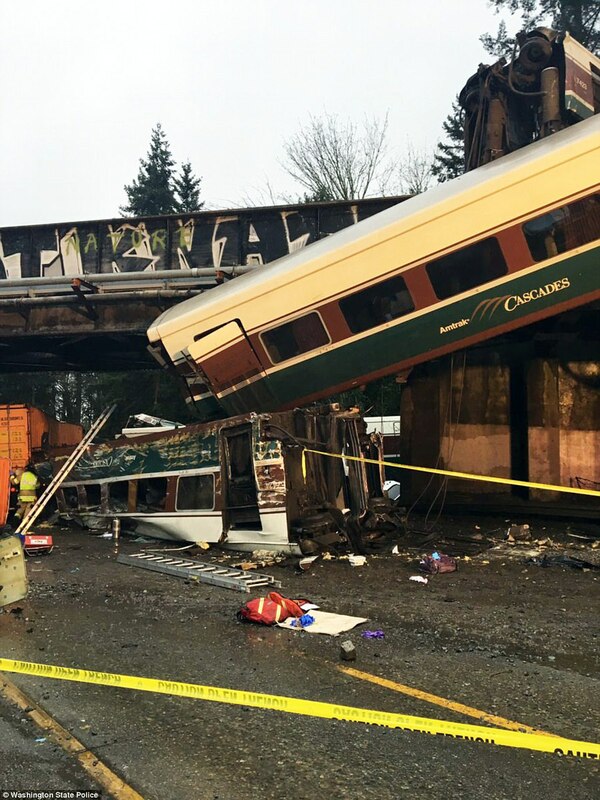 According to the Washington DOT, the train can carry about 250 passengers. Law enforcement officials say there have been injuries and casualties, but have not provided any figures yet. 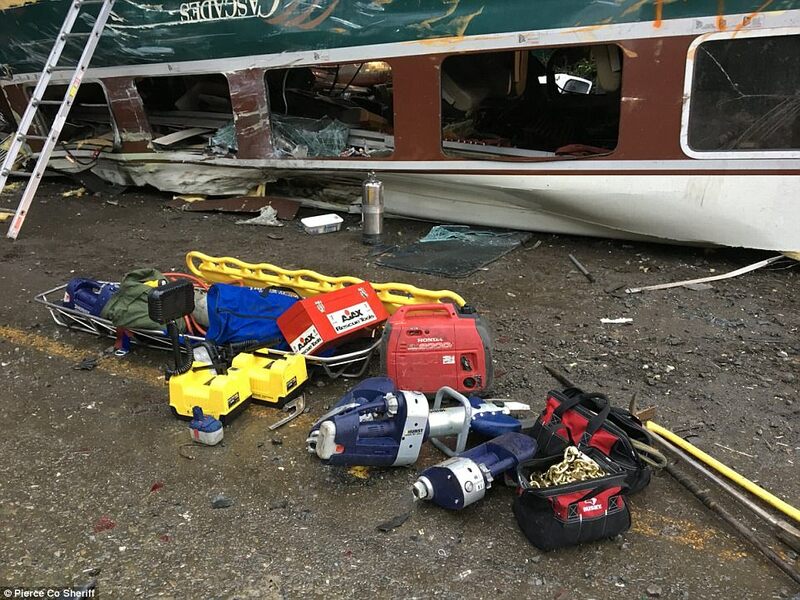 A Pierce County Sheriff's spokesman said there were multiple fatalities on the train. 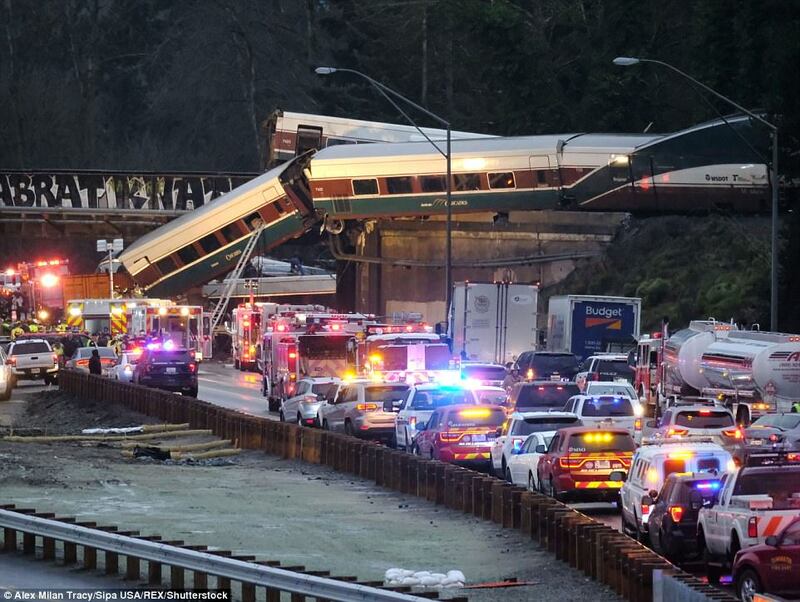 Despite the fact that the train hit several cars and trucks on the freeway below, no motorists were killed. An estimated 77 people were injure, with some being rushed to the hospital and others treated at the scene. 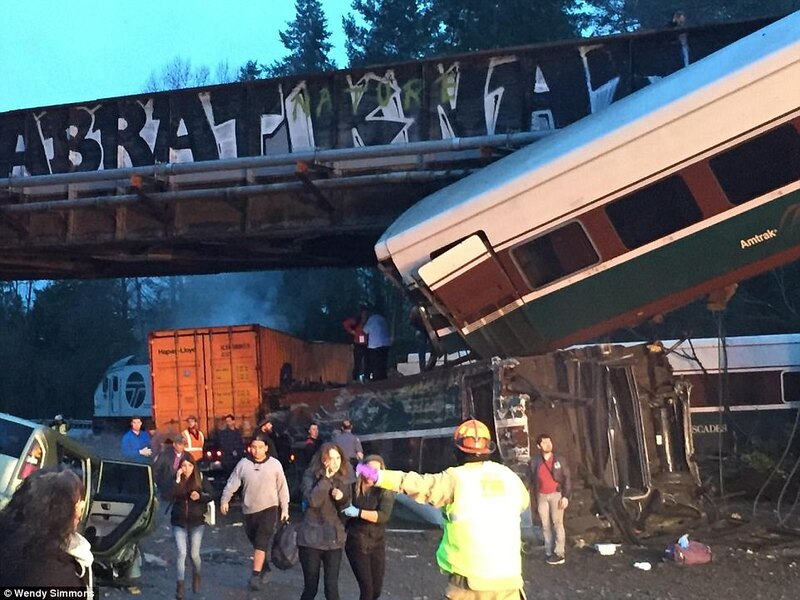 Passenger Chris Karnes told KIRO that at least seven cars derailed. He said the emergency doors were not functioning so they had to kick out the train windows to escape. Maria Hetland was driving to work on the northbound lanes when traffic slowed and she noticed the crash. 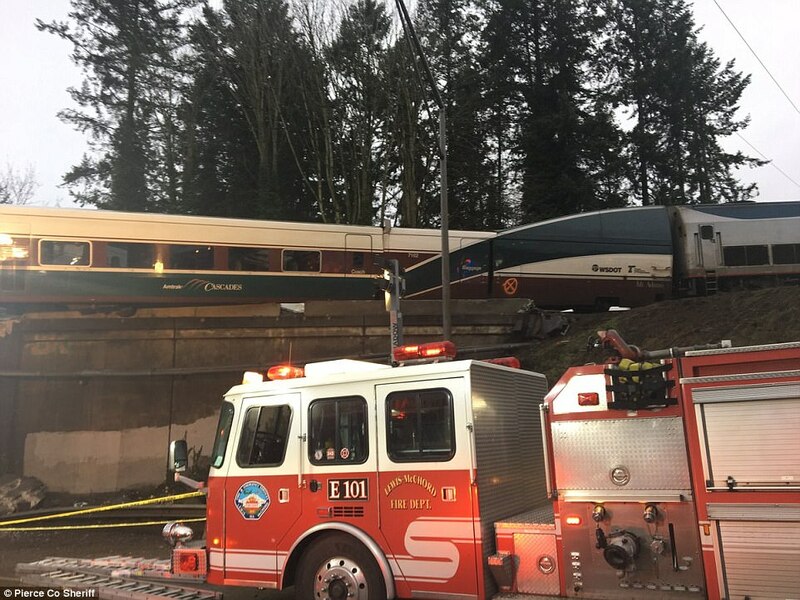 Hetland said she could see people walking around the roadway near the derailment, and people sitting on the side of the freeway wrapped in blankets. 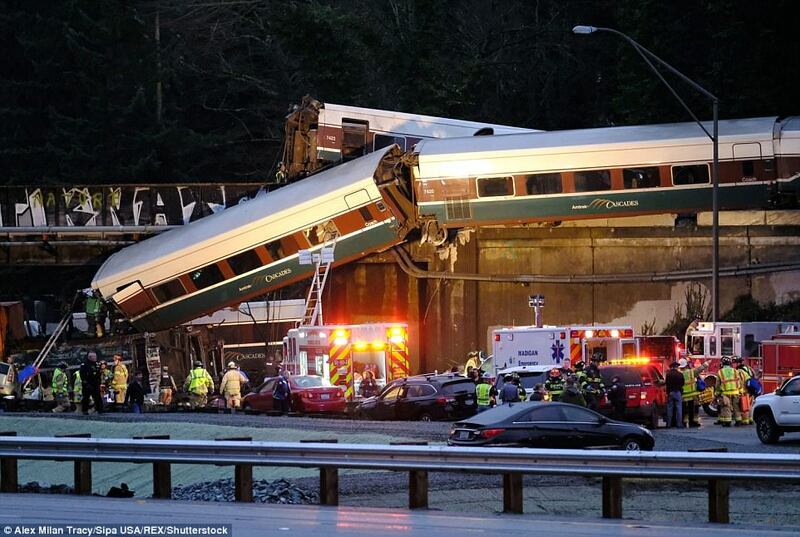 Alex Rozier, a King TV reporter, told NBC News that he got off the train about 10 minutes before the derailment, after taking footage early on in the inaugural trip. He said there were many people on the train for its first trip, including rail enthusiasts. Passengers were given commemorative lanyards for the journey. The new service is supposed to make the journey between Portland and Seattle in 3 hours and 20 minutes, about 10 minutes faster than previous services. Part of the reason why the new route is faster is because it diverges from the main line on a 14-mile bypass between DuPont and Tacoma. The new track is a straighter line so the train can go faster, while the old track was windy and made the journey slower. The bypass already existed but had the tracks needed to be updated for high-speed trains, which heat up the metal on the tracks more significantly. Today was the first day of the new multi-million Amtrak Cascades train service daily along the Portland-Seattle corridor. The more direct route diverged from the shared track which operated with freight trains. 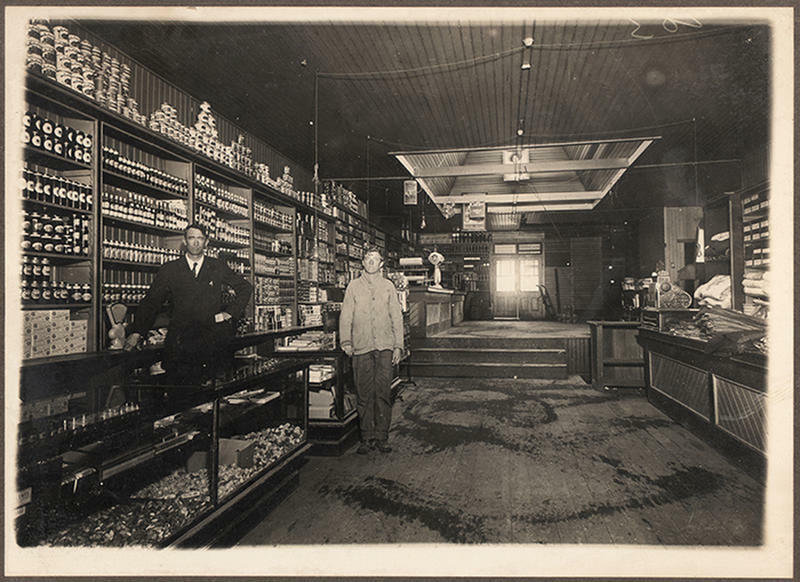 The project was known as the Point Defiance Bypass. 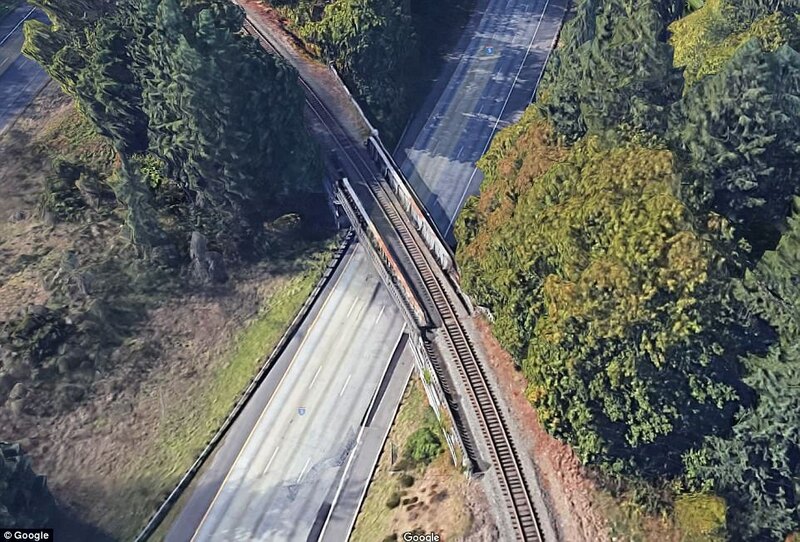 Avoiding a more scene route along the area's iconic Puget Sound, the new high speed line is designed to take 10 minutes off the travel time and travel at up to 80mph. 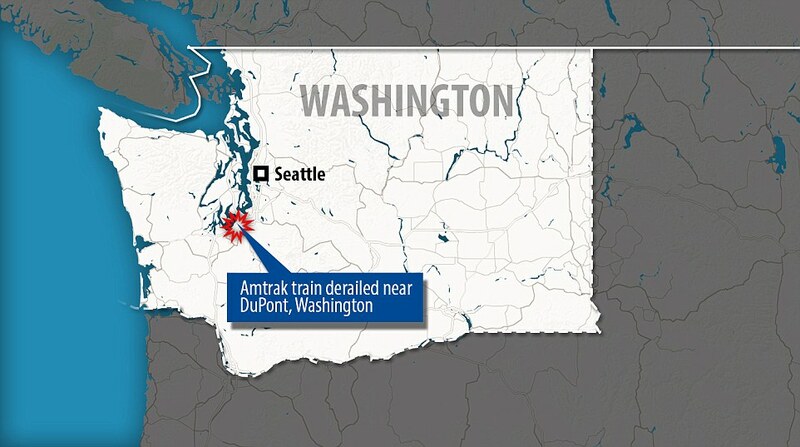 Amtrak issued a press released last week to say that using this route would allow for two more daily round-trips between Seattle and Portland. It would also help trains avoid traveling around tight corners and tunnels. 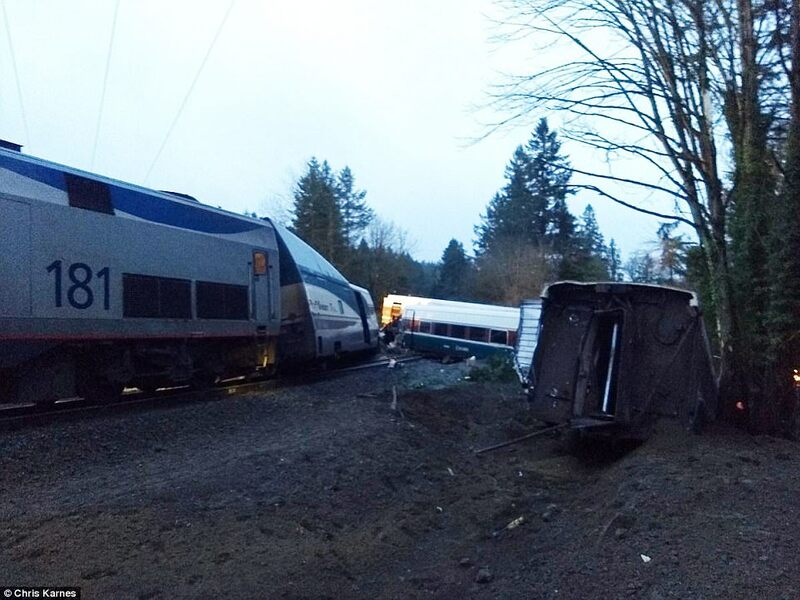 The Amtrak/Cascade trains are pulled by a state-of-the art locomotive known as a 'Charger'. Weighing 42,000 pounds and able to produce 4,400-horsepower they new, quieter and faster engines have been testing for the last month. They are equipped with positive train control systems which automatically stop trains when troubled is detected. However, these are not due to be activate till 2018. 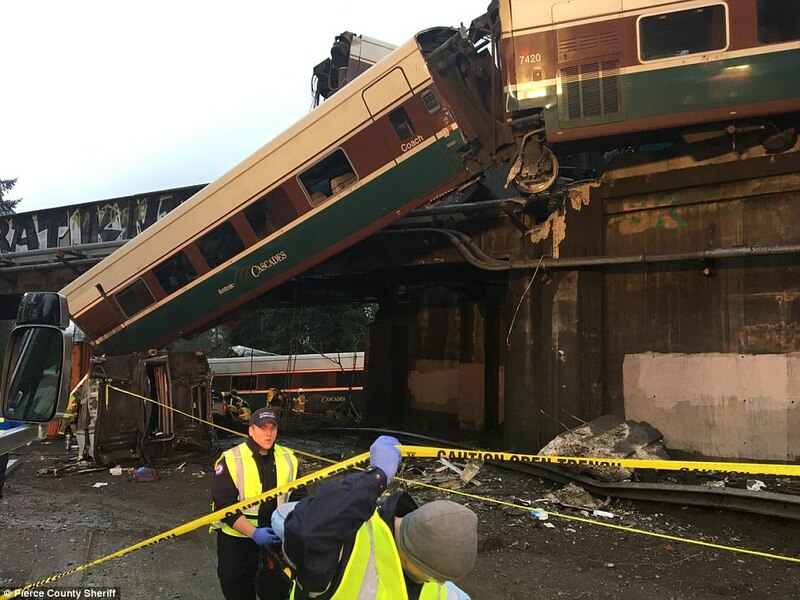 The Washington State Department of Transportation said that at the moment it has no theories as to what caused the derailment. Monday's inaugural trip was the culmination of the $181million project, that also included construction of a new train station at Tacoma. 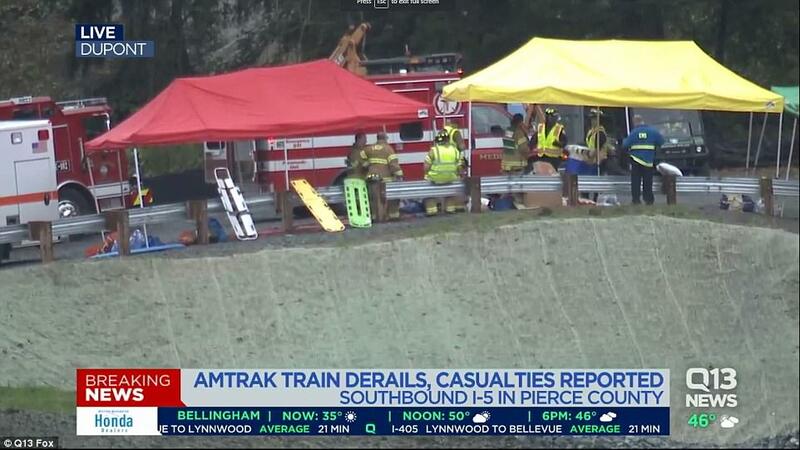 Amtrak service south of Seattle on the line is temporarily suspended. Service is continuing to the north and east of the crash. 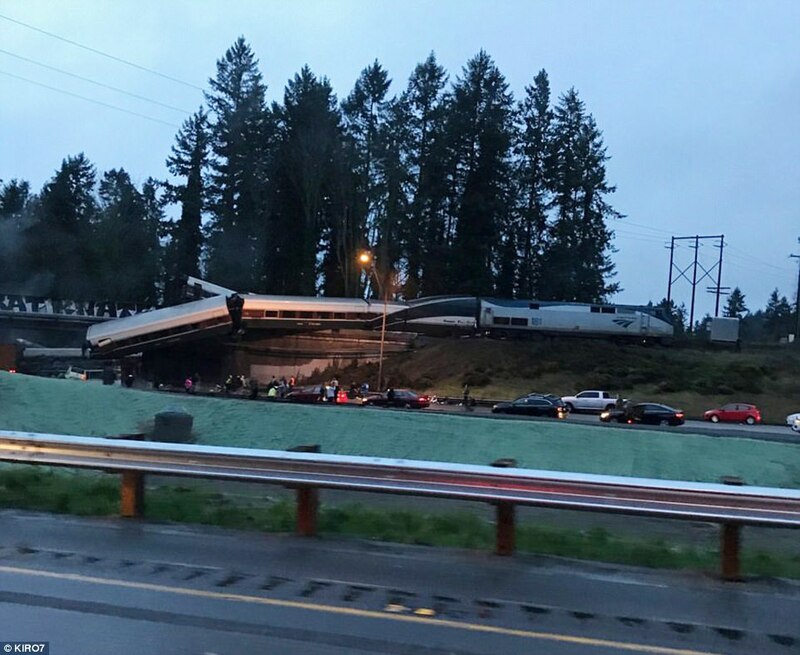 The derailment has also caused traffic chaos on Interstate 5, with all southbound lanes shut down and just two lanes getting by northbound. The State Police said that the southbound lanes will at least be closed down for the rest of the day. 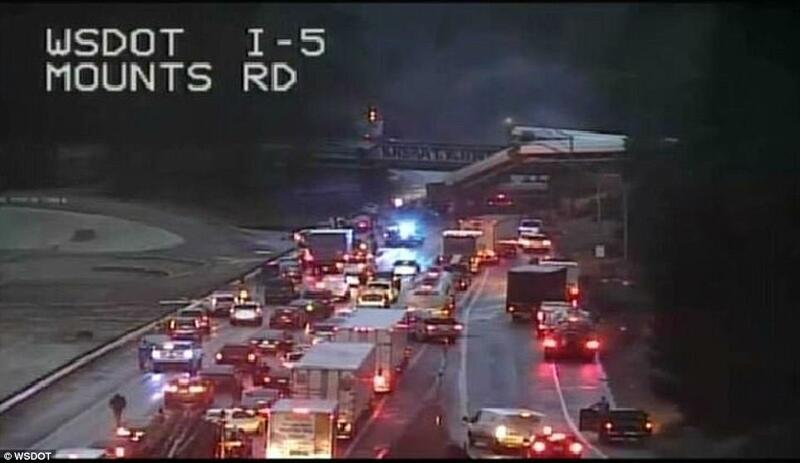 They are asking that people stay off I-5 if they don't need to use it. The freeway is a heavily trafficked road, with even more Washingtonians expected to be on the road this week to do Christmas shopping in sales-tax-free Oregon. Family of victims are being asked to report to the DuPont City Hall to be reunited with their loved ones. They are being told not to come to the scene. President Trump has been briefed on the situation, Press Secretary Sarah Huckabee Sanders confirmed. 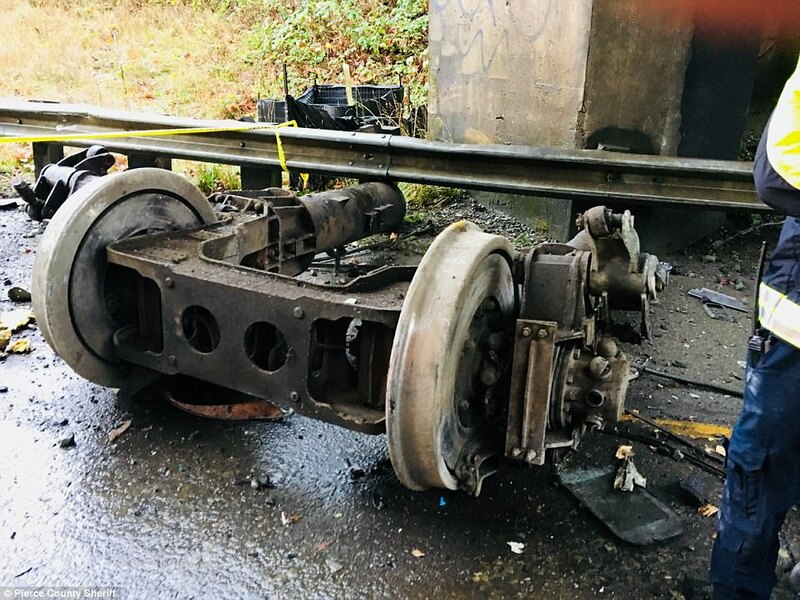 Antifa poured concrete on the tracks and everyone knows it. Sabotage. Well, everyone knows it except the public..